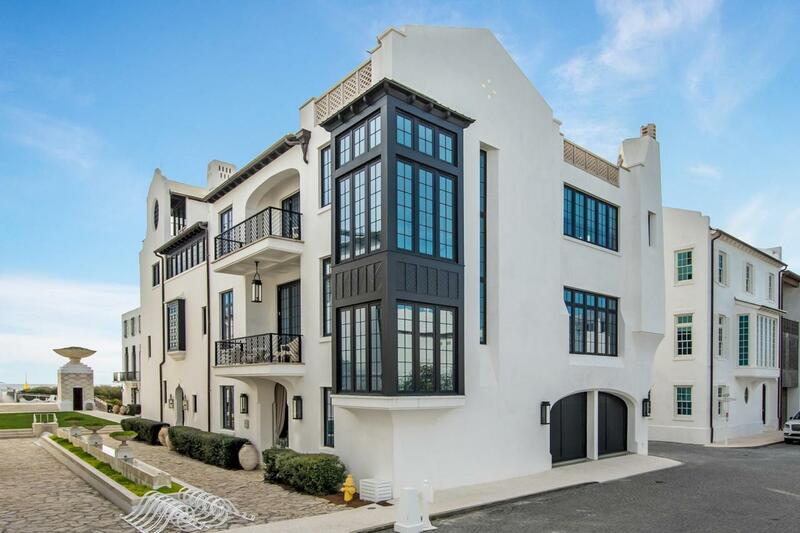 This elegant and luxurious home is located in the exclusive community of Alys Beach, along Scenic Highway 30A and features endless breathtaking gulf views! This private residence has 4 bedrooms and 4.5 baths, an elevator and includes a full sized 2 car garage. The incredible attention to detail is evident in all features from the beginning to end starting with the exquisite quartz tile in the foyer, to the custom kitchen with the spectacular Woodmode cabinetry and the Mother of Pearl backsplash surrounding the Thermador Range. The culinary dream kitchen also features a beverage center built with double refrigerator drawers, wine coolers and an ice maker. A perfect setting for entertaining.The stunning breakfast nook is lovely for enjoying morning coffee from the built-in espresso machine while enjoying the view of the Green. From the rooftop terrace, enjoy amazing sunsets by the fireplace or the outdoor entertainment center. Top of the line geothermal heating and air system is extremely cost effective and highly efficient throughout the year. The residence is equipped with custom lighting, large walk-in closets and abundant storage provide for an ideal home or perfect retreat near the tranquility of the sea.